Well, the final results are in. 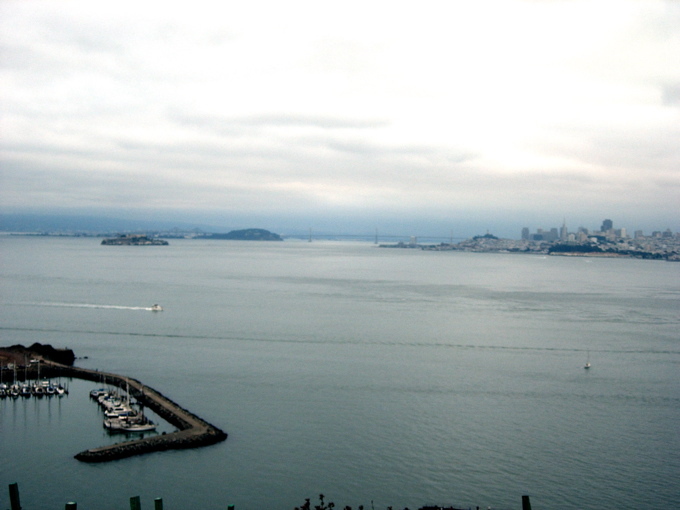 I really did “Escape from Alcatraz”. 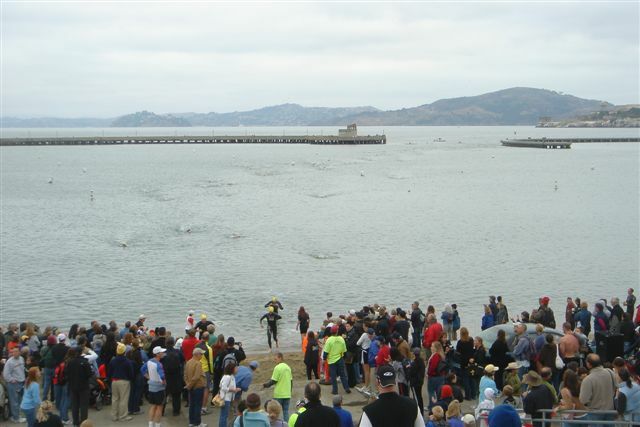 On the 15th of October I swam from “The Rock” to San Francisco in 57 minutes 16 seconds. I placed 97th out of 110 male swim-only participants. 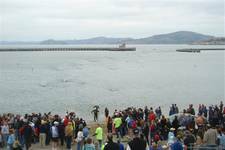 There were many hundreds of participants because the swim was part of a triathlon and, of course, there were female participants as well. Therefore in the total group of participants I certainly placed higher but the organizers do not provide the overall statistics. Nevertheless I am disappointed. So the interesting thing is that my brain very quickly switched from “Can I do it?” to “Why didn’t I do it faster?” – from being afraid to being combative. 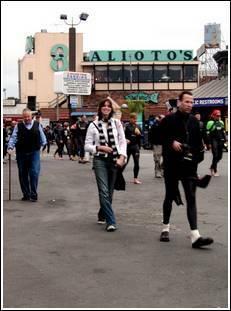 Kathy von Nagel took this picture of me, my daughter Cynthia and hundreds of rubbermen walking along Fisherman’s wharf to the ferry that took us to Alcatraz. 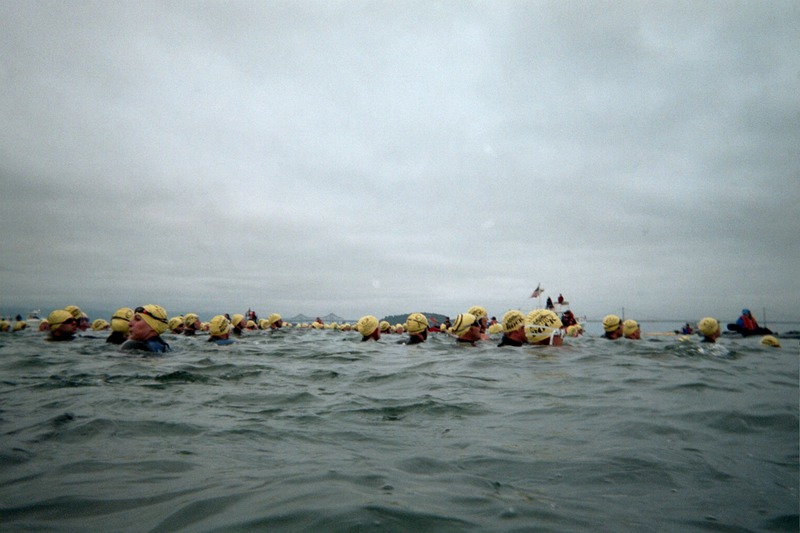 I am one of the few dressed because I did the swim without a wet suit. 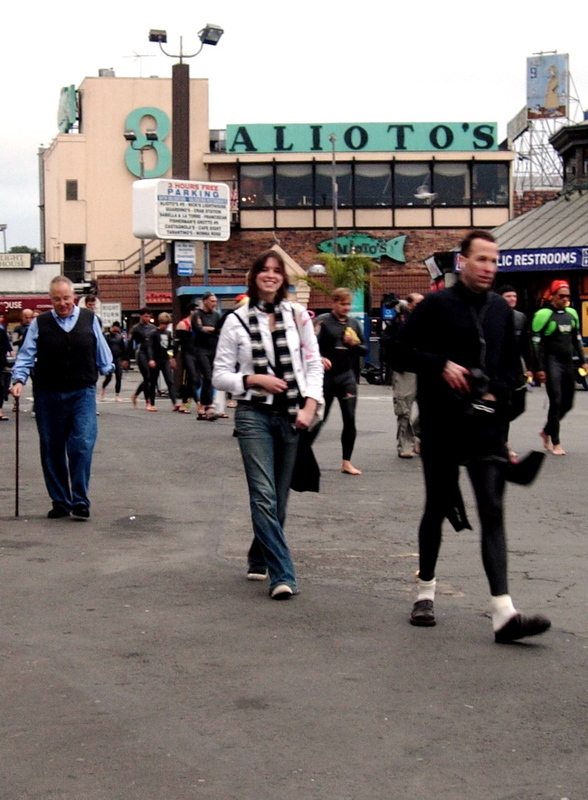 The sight of so many people dressed in black rubber was an unusual sight and stopped the traffic. Pictures taken by Nick Reynolds. 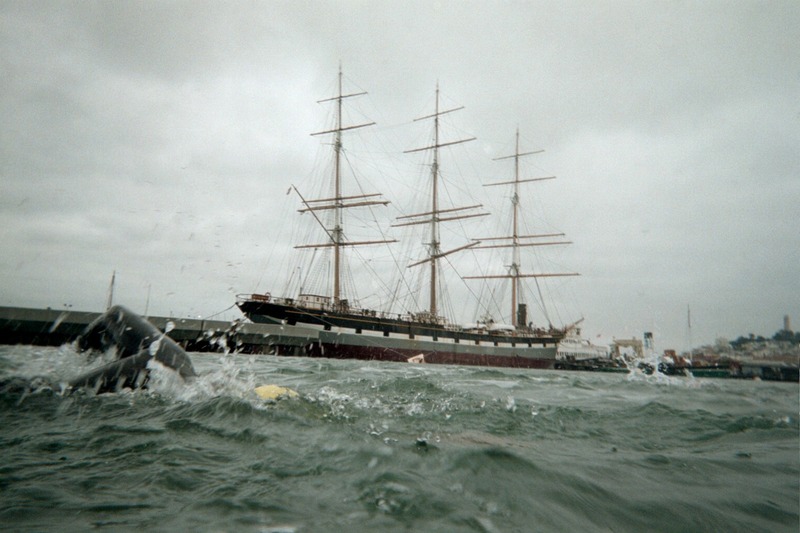 Nick did the swim and while we chatted afterwards I found out that he did the swim with a waterproof camera. These pictures are very real. 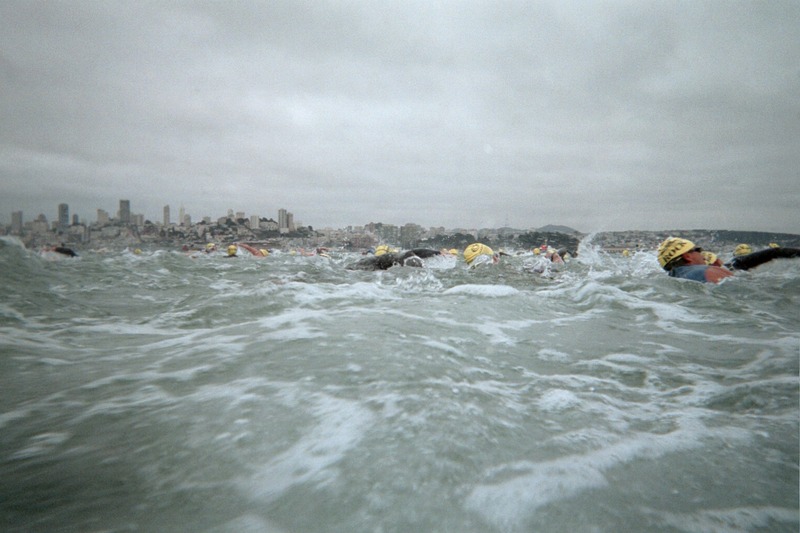 Picture by Norman Dole (member of my reception crew) showing swimmers arriving in Aquatic Park. Picture by Norman of a very happy Theo being welcomed by his reception crew. Picture by Kathy taken on the Golden Gate Bridge during the swim showing Alcatraz on the left and the dark area in San Francisco on the right where I landed. I now support the little conceit that I (a one-handed cripple after all) accomplished something that in theory would kill 99% of the population and has actually killed more than a few in the past. 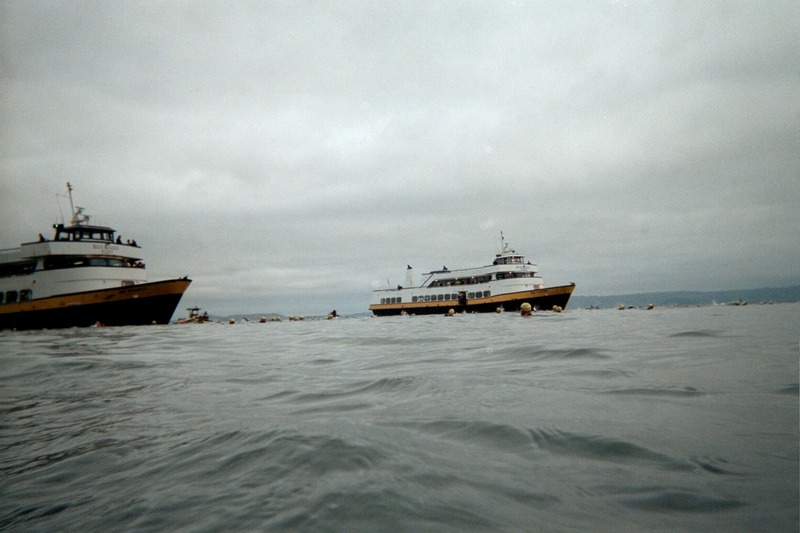 I have assuaged somewhat the memory of almost but not completely swimming the English Channel. And I have proved once and for all that I can be insanely happy. This picture shows a rather tubby, nearly-naked man and a slim, athletic-looking rubberman. Now notice who is the one behind.